A weird combination? Of course not. I made Salted Fish & Mango Sambal, and I just so loved the role play of saltiness, sourness and spiciness in one. 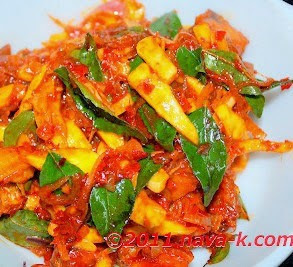 Anyway, have you tried Salted Fish (Pada Salt Fish Pickle & Salt Fish Pickle) & Mango Sambal before? If you have not, you shouldn't comment. Unless and until you make and taste, your feedback is valid. Otherwise? In heated oil, fry fish till crispy. In the same oil, saute shallots and garlic. 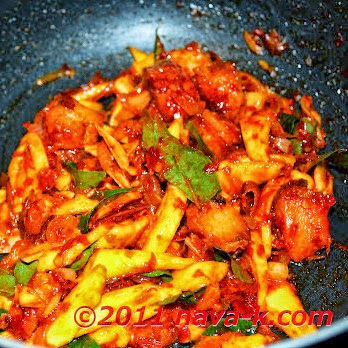 Add chilli paste, belacan, sugar and curry leaves. Stir in for a min or two, dish out. Mmm..... never knew the 2 could go together. Brilliant! Hei, have been checking out yr recipes too,yours are very creative.